Tuesday morning I'll be leaving for San Jose, on my way to the Google All-Stars Summit at the Googleplex in Mountain View. 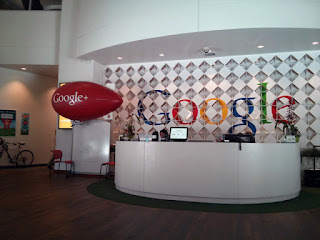 BIG YAM, the Parsons Agency won an all-expense paid trip to Google's headquarters for this annual gathering of the top Google Partner agencies in the country. When I get back, I'll give a summary of what we did and learned while at Google. Okay, so "Dub Dub Dub Dot Frese Dot Net" is not the best title ever for a blog, is it? Trouble is, I can't think of anything better right now, all right? Leave some suggestions for me, and I'll give them due consideration! There will be prizes for the very best contributions! So, I wanted to get a video of some sparrows using our front yard as a dust bath. They'd cleared off some gravel from a patch by the sidewalk. They'd done it before, and I was always puzzled by what the purpose of these patches was. I finally found out Thursday after I got home from work. Three sparrows were simultaneously using a newly cleared off patch as a birdie day spa. Looked like it was a lot of fun -- for the birds. Yesterday when I got home, I placed my cell phone on video camera mode, and put it up against a landscape light to capture the little scamps making dust clouds in my yard. Thanks to my daughter, who faithfully feeds the birds, I thought there would be a good chance they'd be back. Instead, my camera caught a family of quail making their move towards a fine feast underneath the Texas ebony tree. Who can tell me how many quail chicks are in this fine brood?